Average insurance rates for a 2007 Ford F-150 are $1,054 a year including full coverage. Comprehensive costs approximately $186, collision insurance costs $236, and liability costs $474. Buying a liability-only policy costs as little as $522 a year, and high-risk insurance costs around $2,266. Teen drivers receive the highest rates at up to $4,194 a year. Rate data is compiled from all 50 U.S. states and averaged for all 2007 Ford F-150 models. Rates are based on a 40-year-old male driver, $500 comprehensive and collision deductibles, and a clean driving record. Remaining premium consists of UM/UIM coverage, Medical/PIP, and policy fees. For a middle-aged driver, prices range range from as low as $522 for basic liability insurance to the much higher price of $2,266 for a high risk driver. These differences highlight why everyone should compare rates using their specific location and risk profile, instead of using price averages. Want lower insurance rates for your Ford F-150? Confused by the dozens of insurance company choices? You have a lot of company. Drivers have so many companies to choose from that it can be a big hassle to find better rates. Consumers should take time to compare rates periodically because insurance rates are rarely the same from one policy term to another. Even if you got the lowest rates for F-150 insurance on your last policy there is a good chance you can find better rates now. You’ll find quite a bit of inaccurate information about insurance on the internet, so I’m going to show you some tested techniques to reduce your insurance bill. If you currently have car insurance, you should be able to lower your premiums substantially using this information. This information will instruct you on how to get online quotes. But car owners do need to understand how companies sell online because it can help you find the best coverage. Companies that sell car insurance do not advertise every discount in a way that’s easy to find, so here is a list some of the more common and the harder-to-find discounts you could be receiving. Accident Waiver – Some insurance companies will forgive one accident without raising rates if your claims history is clear for a set time period. Multi-policy Discount – When you have multiple policies with one insurance company you may save up to 20% off your total premium. Military Discounts – Being deployed with a military unit could be rewarded with lower premiums. Discount for Good Grades – Performing well in school can be rewarded with saving of up to 25%. The discount lasts until age 25. Pay Now and Pay Less – If you pay your entire premium ahead of time rather than paying monthly you could save 5% or more. Consumers should know that most discount credits are not given to all coverage premiums. Some only apply to individual premiums such as comp or med pay. So even though it sounds like you could get a free auto insurance policy, companies don’t profit that way. To see a list of insurance companies offering auto insurance discounts, follow this link. The quickest method we recommend to compare policy rates is to realize almost all companies actually pay money for the chance to give you rate quotes. All consumers are required to do is provide information including what your job is, whether you drive to work or school, whether you are single or married, and if it has an anti-theft system. Those rating factors is then sent to many of the top insurers and you get price estimates within a short period of time. It’s important that you understand the different types of things that come into play when calculating insurance coverage rates. Having a good understanding of what influences your rates enables informed choices that can help you get much lower annual insurance costs. The list below includes some of the items insurance coverage companies consider when setting your rates. Safe vehicles cost less to insure – Vehicles with high crash test scores tend to have better insurance rates. These vehicles reduce injuries and fewer injuries translates into fewer and smaller insurance claims and thus lower rates. If your Ford earned at least an “acceptable” rating on the Insurance Institute for Highway Safety website or four stars on the National Highway Traffic Safety Administration website you are probably receiving a discount. What are your deductibles? – Physical damage insurance, otherwise known as comp (or other than collision) and collision, is used to repair damage to your Ford. Examples of covered claims could be colliding with a building, collision with an animal, or theft. 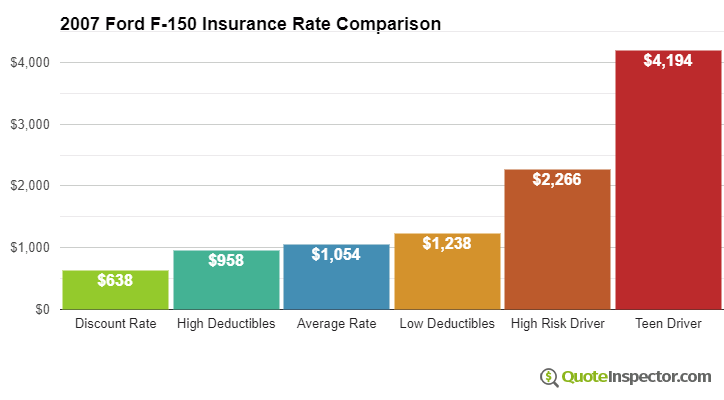 The deductibles are how much you are willing to pay out-of-pocket before a claim is paid by your company. The more money you’re willing to pay, the less your insurance coverage will be for F-150 insurance. Lower miles equals lower premium – The higher the mileage driven every year the higher your rates will be. Almost all companies rate vehicles based on how the vehicle is used. Vehicles left parked in the garage qualify for better rates than those used for commuting. Having the wrong rating on your F-150 may be wasting your money. Make sure your insurance coverage declarations sheet is rated on the correct usage for each vehicle. Don’t skimp on liability – The liability section of your policy is the coverage that protects you if you are found liable for causing damage or personal injury in an accident. Liability insurance provides for a legal defense starting from day one. Carrying liability coverage is mandatory and cheap compared to insuring for physical damage coverage, so buy as much as you can afford. Poor driving leads to higher costs – Drivers with clean records have lower premiums than bad drivers. Just one moving violation may increase your cost by as much as thirty percent. If you have serious violations like hit and run, DWI or reckless driving convictions may find they need to submit a SR-22 or proof of financial responsibility with their state motor vehicle department in order to continue driving. Frequent insurance coverage claims increase rates – If you frequently file small claims, you can look forward to either higher rates or even cancellation. Insurance companies give better rates to people who file claims infrequently. Car insurance is intended for larger claims. Pay less after the wedding – Having a spouse can actually save you money on your insurance coverage policy. Marriage is viewed as being more mature and it’s statistically proven that married couples file fewer claims. When it comes to choosing adequate coverage, there really is not a “best” method to buy coverage. Coverage needs to be tailored to your specific needs. For instance, these questions can help discover if your insurance needs will benefit from professional help. Is pleasure use cheaper than using my 2007 Ford F-150 to commute? If it’s difficult to answer those questions but you know they apply to you then you might want to talk to an agent. If you want to speak to an agent in your area, simply complete this short form. Having a good grasp of your policy aids in choosing appropriate coverage and the correct deductibles and limits. The coverage terms in a policy can be difficult to understand and even agents have difficulty translating policy wording. This will pay to fix damage to your F-150 resulting from colliding with another vehicle or an object, but not an animal. You will need to pay your deductible and the rest of the damage will be paid by collision coverage. Collision can pay for claims such as colliding with a tree, hitting a mailbox, sideswiping another vehicle, backing into a parked car and scraping a guard rail. Collision coverage makes up a good portion of your premium, so consider removing coverage from older vehicles. It’s also possible to bump up the deductible to save money on collision insurance. Liability insurance protects you from damage or injury you incur to other people or property in an accident. It protects YOU against other people’s claims, and does not provide coverage for damage sustained by your vehicle in an accident. It consists of three limits, per person bodily injury, per accident bodily injury, and a property damage limit. You commonly see limits of 50/100/50 which stand for a $50,000 limit per person for injuries, $100,000 for the entire accident, and property damage coverage for $50,000. Liability can pay for claims like funeral expenses, repair bills for other people’s vehicles and pain and suffering. How much liability coverage do you need? That is up to you, but consider buying higher limits if possible. Your UM/UIM coverage provides protection when other motorists either are underinsured or have no liability coverage at all. It can pay for injuries to you and your family as well as your vehicle’s damage. Because many people carry very low liability coverage limits, it only takes a small accident to exceed their coverage. That’s why carrying high Uninsured/Underinsured Motorist coverage is a good idea. Comprehensive insurance coverage pays to fix your vehicle from damage from a wide range of events other than collision. You need to pay your deductible first then the remaining damage will be covered by your comprehensive coverage. Comprehensive insurance covers things such as a broken windshield, hail damage, vandalism and damage from getting keyed. The most your insurance company will pay is the ACV or actual cash value, so if your deductible is as high as the vehicle’s value it’s probably time to drop comprehensive insurance. Budget-conscious 2007 Ford F-150 insurance is possible from both online companies and with local insurance agents, and you should compare price quotes from both to have the best chance of lowering rates. Some insurance coverage companies do not offer you the ability to get quotes online and usually these small, regional companies provide coverage only through local independent agents. As you prepare to switch companies, do not sacrifice coverage to reduce premiums. There are a lot of situations where someone dropped full coverage to discover at claim time that a couple dollars of savings turned into a financial nightmare. The proper strategy is to buy the best coverage you can find at an affordable rate. Insureds change insurance companies for many reasons like high prices, extreme rates for teen drivers, poor customer service or even delays in responding to claim requests. Regardless of your reason for switching companies, switching companies can be less work than you think.